I have been so into thrillers and mysteries lately and this time of year makes me want to read them even more. I compiled a list of some of my favorites including books I want to read, and also some not-so-scary books for people who don't want to be terrified haha. If you have any to add to my list, please comment below! This is my favorite book I've read so far this year. I have raved about it so much that you guys are probably sick of it lol but I'm obsessed. It's about two missing girls over a ten year period. The story draws you in and keeps you guessing until the last minute. I have a book over-review all about it, click here to read it. I recommend this book to everyone because it's a relatively fast read but so good. The end was leave you speechless! I love when you can't predict what will happen and this also includes a love story. Best of both worlds right?? Here is my book over-review. This book is super creepy and totally freaked me out. That being said it was soooooo good! Don't read it if you're home alone though! The book is based on a series of murders that a woman ends up uncovering after she finds hidden documents and files on her husband's computer. What she needs to find out, is how involved he is in these murders. I don't want to tell you much more, just go read it! I loved the last book I read by Slaughter so I was so excited to see another just came out. This one is on my must-read list. Jodi and Todd are at a bad place in their marriage. Much is at stake, including the affluent life they lead in their beautiful waterfront condo in Chicago, as she, the killer, and he, the victim, rush haplessly toward the main event. He is a committed cheater. She lives and breathes denial. He exists in dual worlds. She likes to settle scores. He decides to play for keeps. She has nothing left to lose. Told in alternating voices, The Silent Wife is about a marriage in the throes of dissolution, a couple headed for catastrophe, concessions that can’t be made, and promises that won’t be kept. Decades later, Alice is living in London, having enjoyed a long successful career as a novelist. Miles away, Sadie Sparrow, a young detective in the London police force, is staying at her grandfather’s house in Cornwall. While out walking one day, she stumbles upon the old Edevane estate—now crumbling and covered with vines. Her curiosity is sparked, setting off a series of events that will bring her and Alice together and reveal shocking truths about a past long gone...yet more present than ever. I've heard a ton of buzz about this book but I haven't read it yet. 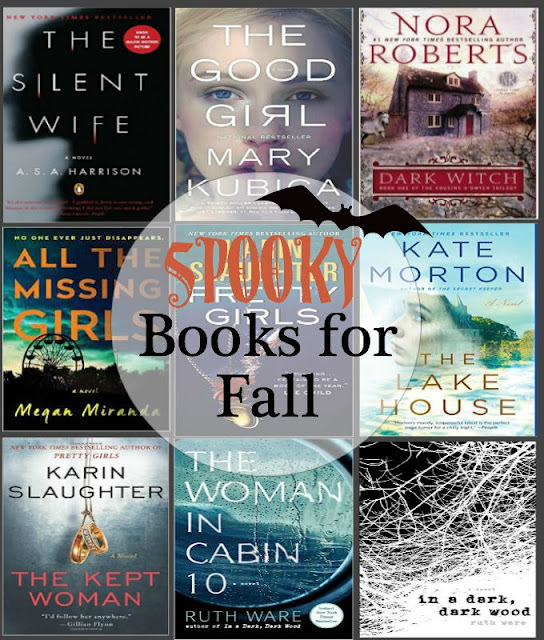 It comes up in every fall book search so I guess it needs to be on my list. It's an interesting concept, so I am definitely intrigued. This trilogy is super light and easy to read. It has a spooky vibe because it's about magic but nothing that will terrify you. Nora Roberts' books always include romance and these don't disappoint in that department. Definitely a great fall read! I love the Harry Potter books and I've read them over and over again. Even though the plot isn't based around Halloween, anything with wizards and magic falls in that category for me. If you have kids, the illustrated version would be so fun to read aloud to them. My favorite is the third book but you should read them in order. I've read The Woman in Cabin 10 and it's really good! Thanks for the suggestions on books to read! I'm adding these to my reading list and I just downloaded All The Missing Girls to listen to while running!